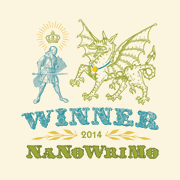 Since 2002, every year (except 2007), I have been writing novels in the month of November for NaNoWriMo. This year was my 8th year of reaching at least 50,000 words. I reached 50,000 words last night. Wow, that's impressive! I have tried twice and not been able to stick to it..